Journey Finder puzzles are a fun little logic game. The aim of the puzzle is simple: to trace a continuous path between the two highlighted cells. You may move one cell at a time in any direction: whether that be up, down, left, right or indeed even diagonally. The path can cross itself but you must not visit any cell more than once and must visit every cell. You must follow the specified route instructions, which can be of various different lengths. With the sample puzzle that you see to the right, the route that you must follow is a sequence that runs 1-2-3-4 and then repeats, e.g. 1-2-3-4-1-2-3-4 and so on. Each Journey Finder puzzle has one unique solution that can be reached through logic combined with a systematic approach to solving the puzzle where various paths may present themselves. 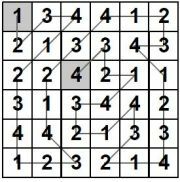 To solve the puzzle at the start it is a great help to work out which cells must be linked together: for instance, if there is a '2' in the middle cell of the grid and only one of the eight touching cells contains a '3', then you know that those two cells must be connected together. Now all you need to work out is which '1' leads into the cell and you have worked out both the entry and exit cell for that 2. 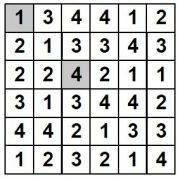 It can often be particularly fruitful to look at the corner and edge cells for quick deductions, as they will have less neighbours and therefore may be more restricted at the start than cells in the middle of the puzzle grid. Once you have placed all the cells that must be linked in a certain way, look out for paths that would quickly become impossible because they would isolate other cells from having both an entry and exit cell: a quick way to eliminate many possible routes. Another simple solving tip is simply to use a pencil, because if you trial a route that does not work out you want to be able to rub it out. Some players like to place solid links they know must be there in pen, then try out various routes with a pencil or a dotted line so that they can easily distinguish what they know for sure and what is speculation. If you are interested in purchasing journey finder puzzles, then please do Contact Us with regard to your requirements. Journey finder puzzles are provided in vector format PDF complete with solution and licensed for print publication: other formats available on request. If you are looking to publish a mixed logic puzzle book then journey finder puzzles can make an ideal addition to such a title, or indeed be published on a standalone basis for instance in a weekly newspaper puzzle page.